Waterproof Equipment Covers | Whats the Difference? Home / Machine Covers / Waterproof Equipment Covers | Whats the Difference? Are you looking for a waterproof equipment covers in plastic, vinyl or canvas? If so then it is important to know the difference before you make your selection as there is a lot of confusion to the actual term waterproof. Below you will see three different terms which are used to describe various states of industrial covers being waterproof, water repellent, and water resistant. Customers use these terms interchangeably but they actually are not the same thing. Below you will find the actual definitions. (This video is helpful as well). Water Resistant Covers are the lowest level of protection from water. If a cover is labeled water resistant, that simply means that the cover itself is built in such a way that it is difficult for water to get inside. Or that it is coated with a spray that helps improve the covers water resistance. Water-repellent Covers are a step up from water resistant covers. A cover which is labeled water repellent means that it has properties which allow it to repel water making it hydrophobic. These covers have a much better chance of standing up to water than your average cover. Waterproof Covers are manufactured in such a way that they are impervious to water. The material itself is water repellent and the manufacturing process used makes the cover waterproof. This can include heat sealing as the manufacturing process as opposed to stitching the covers together. It can also include stitching with a special sealant along the seams. You can see with the use of these three different terms there is a lot of confusion associated with their use. It’s no surprise that suppliers and customers often use them incorrectly. As a result, products labeled as water-resistant, water-repellent, or waterproof are often mislabeled or misrepresented in the market. As with all products on the market, longevity comes into play when taking into consideration usage and the environment the covers are used in. Waterproof generally communicates the idea that a cover will be waterproof for the life of the cover and that it will never fail. While we provide some of the highest quality covers on the market, they eventually will fail. There are things you can do to ensure the longevity of your covers. Our covers are made using a process of custom sewing or heat sealing based on your application requirements as they relate to the three terms above. Generally we use Vinyl, nylon, polyester or Tyvek depending on your application and environment. We also utilize features like grommets, webbing strapping, hook and loop Velcro and elastic to secure these covers tightly to your equipment. 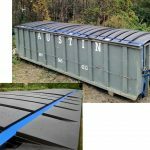 No matter which style you are looking for, ALCO can provide you with a cover that will be a perfect fit and that will keep your equipment dry.